As Microsoft is preparing to roll out the Surface Pro 3 to customers over the summer, early reviews of the Windows 8.1-powered hybrid computer exposed an unpleasant issue with its battery. After leaving the Pro 3 to charge overnight, tech reviewers from Neowin, ZDNet, and other media surprisingly woke up to a device with an empty battery. Not being able to turn on the tablet even when it's connected to the wall socket is quite the deal breaker. Thankfully, Microsoft is aware of the issue, and is going to release a fix before the Surface Pro 3 hits the market. Hopefully, this means the problem is in the software, instead of the hardware department. 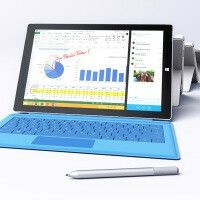 Microsoft's Surface Pro 3 is available for pre-order in configurations ranging from an Intel Core i3-equipped device with 64GB storage ($799) to a Core i7-powered slate with 512GB of space ($1949). The earliest to ship to customers will be the Core i5 variants with 128GB and 256GB storage, which will arrive in June. The rest of the pack should arrive by the end of August. How they are released first in the market? Did they test it before? Do we expect more issues? Strange!